Here I am trying out my new Sale-A-Brations set. It's called Bliss. I like the design of the large stamp and then the little flower and bird are fun to add on the card too. 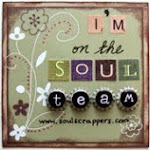 All products used here are stampin up. Thanks for stopping by.